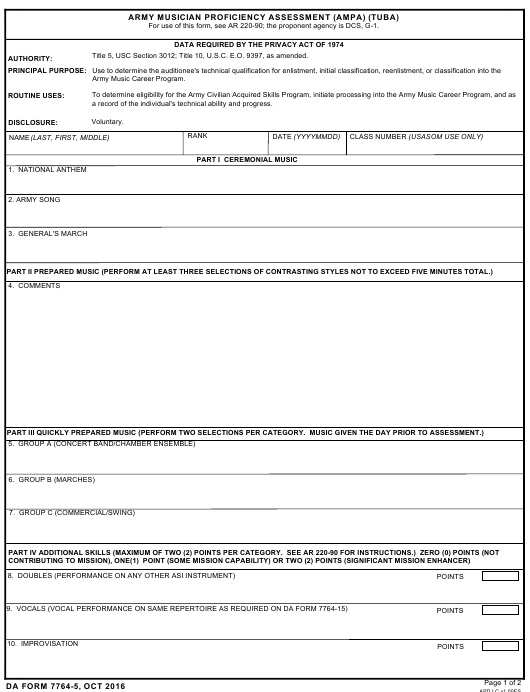 DA Form 7764-5 - also known as the "Army Musician Proficiency Assessment (ampa) (tuba)" - is a Military form issued and used by the United States Department of the Army. The form - often mistakenly referred to as the DD form 7764-5 - was last revised on October 1, 2016. Download an up-to-date fillable PDF version of the DA 7764-5 below or request a copy through the chain of command. For use of this form, see AR 220-90; the proponent agency is DCS, G-1. Title 5, USC Section 3012; Title 10, U.S.C. E.O. 9397, as amended. a record of the individual's technical ability and progress.